Give me 3-minutes, and I’ll show you some of the best natural hair loss treatment for women that has proven to work for many. Hair loss in women is basically a common condition which can result in lots of uncomfortable states and emotional distress. It can equally be a pointer to some disturbing health condition and, therefore, should be given adequate attention. Autoimmune disorders, stress, and protein deficiency are some of the things that can lead to hair loss in women. However, hair loss symptoms can differ from being minor to acute. These include receding hairline, bald patches, thinning of hair, and so on. The good thing is that there are lots of home remedies, treatments, and various preventions available for fighting hair loss – and we’ve discussed them all in this article. Is your hair loss condition giving you sleepless nights, and making you feel that you’re no more an attractive woman? If you answered yes to this then, I want you to know that you’re not alone. In this article, you will learn the best hair loss treatments that will aid you in fighting your hair loss problems. Women naturally feel they are no longer beautiful once they are confronted with hair loss, acne, skin rashes, or any other thing that tampers with their beauty. Even as it is always difficult to convince women that their beauty can be restored back, I want to assure you that this best natural hair loss treatment for women which I am going to talk about in this post will really help to restore the luster, texture, and strength of your hair. Therefore, I will urge you to stick around and read this post from start to finish as you’ll be able to find some golden nugget that will help you win the hair loss battle. Telogen Effluvium is another name for hair loss post-pregnancy. What usually leads to this uncomfortable condition is a fall in the estrogen levels after pregnancy. It particularly happens between the 3 to 6 months period after pregnancy. Basically, this Telogen Effluvium is a really common cause of hair loss in women – according to some studies, on average, about 40 to 50 percent of women experience hair loss for a temporary period of time post-pregnancy. This is one of the main and common causes of hair loss in women. This type of case can come as a result of trauma, divorce, surgery, and so on – these can all be key stress-inducing factors, and, therefore, you may notice a significant amount of hair fall during any of these periods. It often comes as a result of your body putting lots of efforts into directing its resources towards resolving the situation. 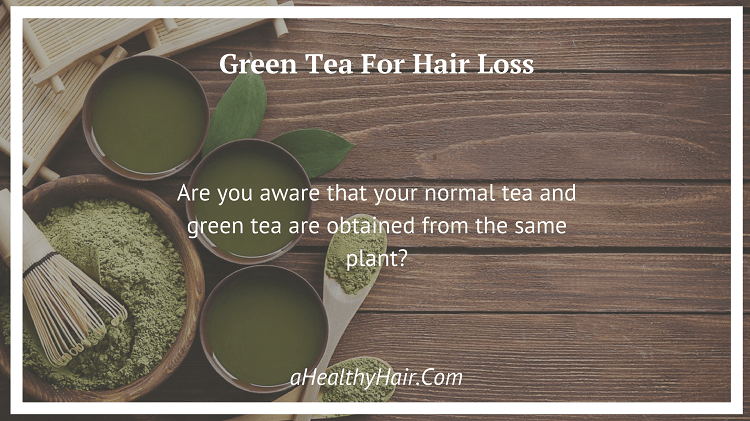 Additionally, physical changes such as high fever, sudden weight loss, and so on, can equally lead to hair loss. It’s essential to have sufficient amounts of protein in your diet if you really want to prevent cases of hair loss. When people go on dieting sometimes, they consequently cut down on protein-rich foods. This often results in protein malnutrition and when this occurs, the body tries to reserve some protein by halting hair growth. Unfortunately, this will lead to the shedding of the hair in the next 2 to 3 months. That being said, it is equally fairly easy to reverse and avoid hair loss caused by a protein deficiency, and that is by always eating protein-rich food. 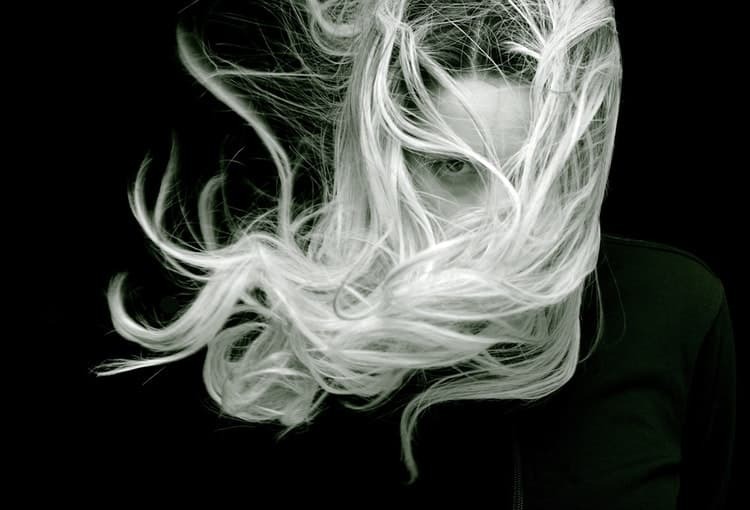 In case you don’t know yet, your scalp health plays a significant role in overall hair growth. If you have an unhealthy scalp, you may be experiencing hair loss as a result of seborrheic dermatitis, fungal infection, and dandruff. Excess oil together with hormonal changes in the body indeed affects the health of your scalp. So, without any more delay, let’s get to the main points. You obviously want those gleaming hair, glittering eyes, strong teeth, and bright skin. But the problem is that you’re confused on how to achieve those right? …Just give your body the nutrition it needs. Taking enough protein not only important for your overall help, but it’s also crucial for hair growth specifically. So how do you go about this? Simply eat a combination of beans, meat, and farm products to buttress a healthy and strong hair growth. One thing you might not have known is that using the right supplements can help curb hair loss. You don’t have to complicate this, however, just ask your doctor about the best drug to take without any harmful contaminants and side effects. Furthermore, if you’re taking other drugs, it’s important to consult your physician of the right supplement to take. The fantastic effect of a proper scalp massage is that it promotes blood circulation to your scalp thereby stimulating your hair follicles. There are equally a lot of hair Oils that be used for scalp massaging to add a more soothing effect. For example, hair oils such as Amla and Neem and are known to equally help promote hair growth. To do this, simply warm the oil and apply it to your Hair. Then gently massage the scalp for about 3-5 minutes – after which you should use neat water to rinse the warm oil out of the hair. Interestingly one of the best and most recommended ways to avoid hair fall in both women and men is via stress management. Both physical and emotional stress can lead to hair loss. Once you’re worried, your hair gets thinner. It’s natural sometimes to experience hair fall or hair thinning, but once you can’t properly manage your stress, it can be quite severe. Are you aware that your normal tea and green tea are obtained from the same plant? Interestingly, the healthier cousin of the tea family is essentially a variation of your normal black tea, it’s only processed in a different way. Black tea is fermented, while green tea is the steamed and dried equivalent of the plant, and is, therefore, filled with minerals and nutrients. I believe by now, you might have known why it’s called green tea. Furthermore, the content of caffeine in green tea is much lower than that of black tea, thus making it a healthier choice. Also, green tea has a particular set of chemicals known as catechin polyphenols that are responsible for the astringent and bitter taste. These flavonoids are incredibly powerful antioxidants, and together with amino acids such as lignin, thianine, and butyric acid, they make green tea a really viable option. Aside from that, green tea is equally rich in lots of vitamins such as A, B1, B2, B3, C and E. All these things are indeed enough to call green tea a packaged miracle. Don’t you agree? Pour hot water over green tea bags. Squeeze the bags into the water once they are cool. Add two teaspoons of dry mustard into it. Use the mixture to massage your hair for 10 to 15 minutes. Repeat the massaging every 4 – 7 days for up to 8 to 12 weeks. Omega 3 fatty acids are unsaturated ingredients which are important to the appropriate functioning of the body. Omega 3 is needed in the body to uphold good health and hair. However, the body does not produce omega 3 naturally. That means that if you’re looking for healthy, flourishing hair, you need to proactively find and include omega 3 to your diets in order to amass its numerous benefits. But does omega 3 have any benefits for hair? And how can it be used for hair growth? The benefits of omega 3 for hair are countless – it not only helps prevent and fight hair loss and breakage but equally encourages healthy, lush hair and even hair regrowth. 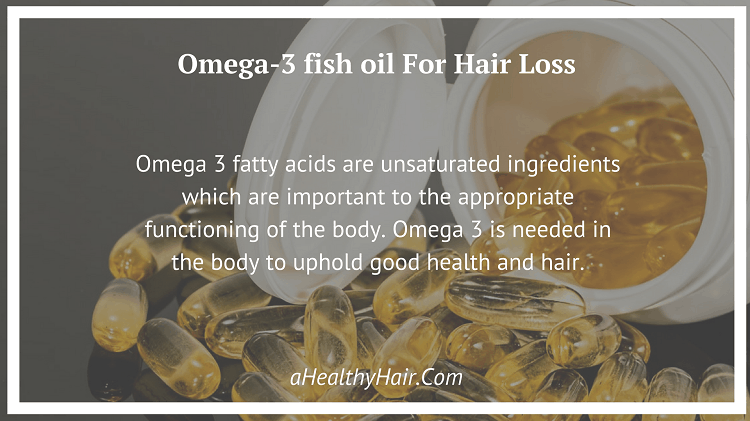 Furthermore, the fatty acids in omega 3 help in reducing inflammation and nourishing hair follicles, thus improving hair growth and overall health of hair. Additionally, nourishing omega 3 fatty acids equally moisturize and soothes the scalp, thereby promoting circulation of blood, and thwarting dryness and dandruff. Moreover, these fatty acids also foster the production of scalp oils, which coat and nourish hair strands naturally, thus helping to transform lifeless or dry tresses. Finally, applying Omega-3 fish oils topically to the hair will help the dormant hair follicles to be reinvigorated. The result of a 2008 study showed an impressive 85% rate of success among the people who used the Omega-3 fish oil on their hairs. In some cases, results were noticed in a matter of days. 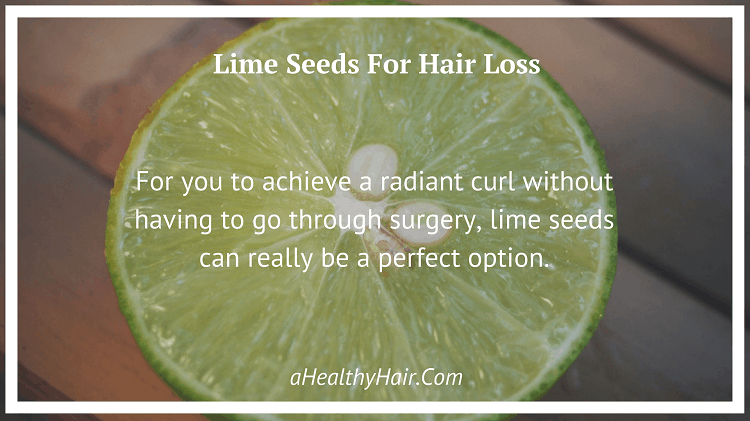 For you to achieve a radiant curl without having to go through surgery, lime seeds can really be a perfect option. Pepper boast its antibacterial and antioxidant agent, while lime seeds are superabundant in Vitamin C – both of which can ultimately fasten hair growth. Mix ground pepper with the powdered lime seeds – add a little portion of water until it smooths, then use it to massage on scalp. 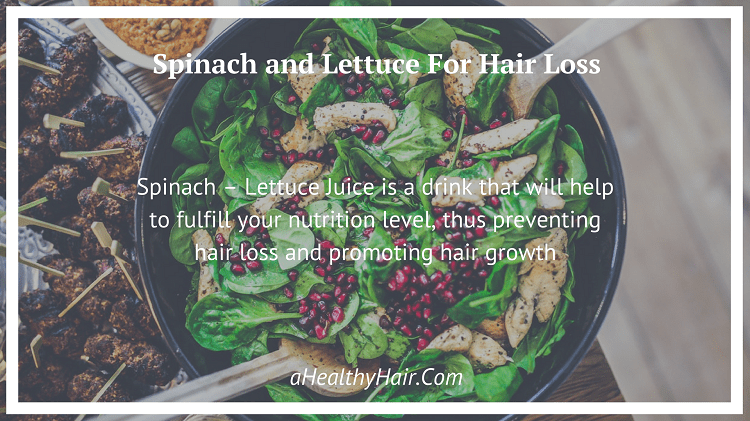 Spinach – Lettuce Juice is a drink that will help to fulfill your nutrition level, thus preventing hair loss and promoting hair growth. Simply make a juice from spinach and lettuce and apply it directly to the scalp. This works wonders in helping women suffering from vitamin deficiency in regrowing their hairs. Sulfur helps in preventing breakage of hairs as well as in accelerating hair regrowth. One natural source of sulfur is onions. 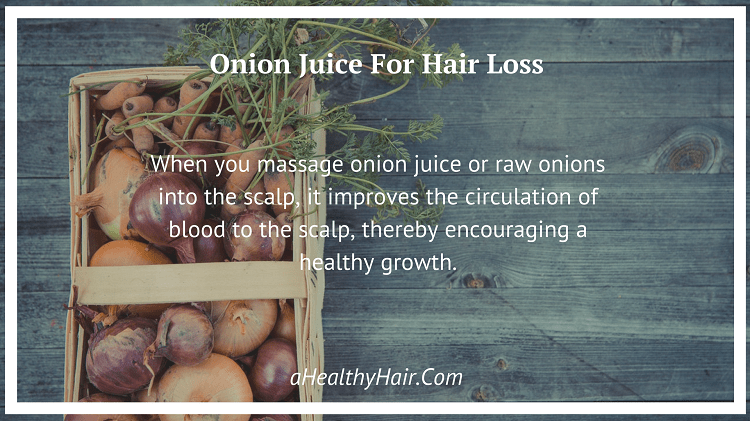 When you massage onion juice or raw onions into the scalp, it improves the circulation of blood to the scalp, thereby encouraging a healthy growth. Onions also offer the hair follicles nourishment and replenish lost nutrients. This helps the hair to naturally grow faster. Another advantage of onions is that it possesses anti-bacterial properties which help in preventing parasites and infections of the scalp. In addition, onions help in increasing the amount of the natural antioxidant, catalase. A reduction in the level of catalase has been linked with premature graying of hairs. But as you use onion juice, this natural oxidant is increased thereby minimizing premature graying of hairs. Honey and oil blend is a super effective homemade hair loss treatment. Olive Oil has always been a long proven remedy for the treatment and control of dandruff. It can equally serve as hair conditioning as stated by the Olive Source. Packed with powerful antioxidants, Vitamin A and E, and monounsaturated fatty acids – it can help in moisturizing and fixing your damaged hair. 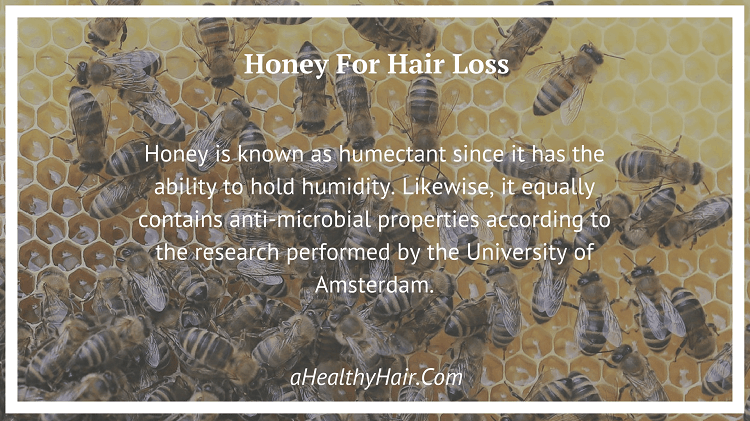 Similarly, honey is known as humectant since it has the ability to hold humidity. Likewise, it equally contains anti-microbial properties according to the research performed by the University of Amsterdam. Stop spending your money on artificial hair products that, at best, help in destroying your hair the more. Make use of the four natural ingredients mentioned above. They are quite easy to access and they are affordable. Above all, it doesn’t take a genius to prepare them. Use this tips to ensure you maintain a strong and healthy hair.